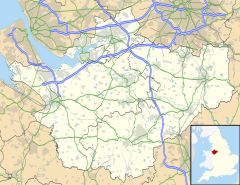 Alsager (/ˈɔːlseɪdʒər/ AWL-say-jər) is a town and civil parish in the unitary authority of Cheshire East and the ceremonial county of Cheshire, England, to the north-west of the city of Stoke-on-Trent, and east of the railway town of Crewe. The town has a population of 11,775. The civil parish is bordered by the parishes of Betchton to the north, Church Lawton to the north-east and east, Kidsgrove in Staffordshire to the south-east, Audley Rural, in Staffordshire to the south, Barthomley to the south-west, Haslington to the west, and Hassall to the north-west. Despite Alsager's Staffordshire postcode and Crewe dialling code, it is its own town, and is not part of Crewe or Stoke-on-Trent. In the centre of Alsager is a lake, Alsager Mere. This isolated pool, once the focal point of the town, is only accessible by two fenced public viewing areas and by local residents who have gardens adjoining the waters. Alsager has hosted an annual summer carnival since 1998. Until June 2009 the summer carnival was located in Milton Park, but it had since moved to the Alsager School Playing Fields to increase capacity, until moving back to Milton Park in 2017. In 2007 Alsager was awarded Fairtrade Town status by the Fairtrade Foundation. In the neighbouring civil parish and village of Church Lawton are the Church Lawton Barrows, which form part of a significant Bronze Age site near the town. Alsager was recorded as 'Eleacier' in the Domesday Book, and was a small farming village until the 19th century when, due to its rail connections and rural character, it became a home of choice for pottery works managers from the nearby Federation of Six Towns which later became the city of Stoke-on-Trent. During the Second World War, a large armaments factory was built outside Alsager at Radway Green, and the town expanded dramatically to house the influx of factory workers. Also during the war a camp was constructed for the training of Royal Marines. This bore the name of "H.M.S. Excalibur" and was situated at the top of Fields Road by the side of the Stoke to Crewe railway line. In 1948 it became a displaced persons camp for refugees from Estonia, Latvia, Lithuania and the former Polish Ukraine, countries which had been forcibly incorporated into the Soviet Union. Many men from these countries had fought on the side of the Germans to try and regain independence, and they were afraid to return to their countries of origin, as many who had returned were executed by the Russians. A school was set up for the education of their children whose only common language when they arrived was German. The school continued to exist for many years in the same set of wooden huts under the name "Excalibur School". The first Roman Catholic church in Alsager was one of the wooden huts and was attended mainly by the Lithuanians, most of whom were Roman Catholic. The Anglican churches are Christ Church (1789), and St. Mary Magdalene (1898). Alsager previously had three Methodist churches at Hassall Road (Wesleyan), Wesley Place (Wesleyan), and Crewe Road (Primitive Methodist). By December 2009 two Methodist churches remained, but today there is just one. The artist James Lloyd was born in the town. The town is home to Alsager Community Theatre (ACT), an amateur drama group founded in 1973. ACT puts on its productions at Alsager Civic and at nearby Little Moreton Hall. Formerly housed on Manchester Metropolitan University's Alsager campus, Alsager Arts Centre had a public programme of touring new performance and visual art work presented in two intensive seasons – September to November and January to March. The centre has now moved to the university's Crewe campus, as its Alsager site has closed. Alsager hosts the annual Alsager Music Festival which takes place in Milton Gardens. Public education, at primary and secondary school level, is managed by Cheshire East Council and the Alsager Community Trust. The Alsager Community Trust is a co-operative trust, in which all the schools in the town are members. Secondary education is provided by Alsager School, an Academy school, that is situated opposite the former Manchester Metropolitan University campus. It is attended by over 1,300 pupils between the ages of 11 and 18. Alsager School is a Business and Enterprise College. During the Second World War a Hostel built of wooden army huts was constructed on the site of the MMU to house workers at the Royal Ordnance Factory, Radway Green, and was called "Heathside". In 1945 it became "Alsager Training College" for the training of teachers which were in short supply at that time. The wooden huts were still in use for the housing of students until the early 1960s. The MMU Alsager was home to the Contemporary Arts and Sports Science Departments of the Manchester Metropolitan University. The University absorbed the former Crewe & Alsager College of Higher Education, forming the Crewe and Alsager Faculty, subsequently renamed MMU Cheshire. The Alsager Arts Centre was also on campus, and promoted touring contemporary dance, music, theatre, live art, performance writing and visual art events to the public as well as members of the University community. In 2006 the university started transferring staff and departments from Alsager to the Crewe campus, as part of plans for closure of the Alsager site. The Arts Centre also moved to the MMU campus in Crewe, and was renamed the Axis Arts Centre. As of 2012 the entire Alsager campus had long since closed and fallen into disrepair. In 2015 the former campus on Hassall Road was earmarked for a total of 408 new houses. By early 2018 all of the campus buildings had been demolished and the site cleared. Soon afterwards, construction of a new housing estate named "Scholar's Place" commenced on the site of the former Alsager campus. Alsager is close to junction 16 of the M6 motorway, and is served by Alsager railway station with East Midlands Trains services on the Crewe to Derby Line and West Midlands Trains services from Crewe to London Euston, both operating hourly during the working day. Buses (the number 3) run to Crewe and Hanley every 30 minutes. The 317 bus service links Alsager with Rode Heath, Sandbach and Leighton Hospital once an hour, and service 318 with Rode Heath and Congleton once every two hours. Alsager town centre is characterised by independent and charity shops. The only national chain supermarkets in the town are a medium-sized Asda supermarket and Sainsbury's Local. Between 2012–13 Alsager town centre has been redeveloped somewhat:The Co-operative Food store was rebuilt and enlarged in 2012, but it was sold off and converted to an Asda supermarket in 2015. A Town Square has been created, Fairview park has been rebuilt and capacity at Fairview Car park has been increased. In April 2014 Cheshire East Council gave planning permission for the development of a new Sainsbury's store on the former Twyfords site off Lawton Road. Sainsbury's are currently reviewing their plans for a large store in the town due to changing patterns in the way people shop, which is currently away from large stores to online shopping and top up shopping at smaller stores. The company along with its rivals have scrapped many major new store schemes throughout the UK. There are currently proposals to build 1267 new build houses, a new supermarket and petrol station in Alsager. Alsager is home to AFC Alsager, Alsager Town F.C., Alsager Bank Corner FC, Alsager Cricket Club, the Alsager Golf and Country Club, the Alsager Institute Bowling Club, the Alsager Company of Archers, Triton Hockey Club and Alsager Lawn Tennis Club. It also has a number of youth teams in the 'lads'n'dads' league. There is a thriving pool league. There is a swimming club. There is a leisure centre within Alsager, this is managed by Cheshire East Council. Alsager has several parks. The town's main park is Milton Garden, which has an ornamental sunken garden, a skatepark, a small children's football pitch and a play area. There is a strong tradition of allotment holding in the town, administered by the Alsager Gardens Association. Arthur Lockett (1877–1957) was an English footballer who played for Aston Villa, Preston North End and Stoke City F.C. Lee Bell (born 1983 in Alsager) is an English former professional footballer who last played as a midfielder for Macclesfield Town, on loan from Burton Albion. Lloyd Saxton (born 1990 in Alsager) is an English footballer who plays for the Swedish football club GIF Sundsvall. Rowan Cheshire (born 1995 in Alsager) is a British freestyle skier who represented Great Britain at the 2016 Olympic games. Alsager is home to Borrow Pit Meadows, a local beauty spot situated in the north of the town, which leads on to the Salt line. The town also has a woods leading to Church Lawton. Near the train station, there is another walkway sheltered by trees called Merelake way. This runs alongside Alsager golf course. ^ a b Official 2011 Census figures. Neighbourhood Statistics website. Retrieval Date: 10 May 2013. ^ Alsager Mere. Archived 7 February 2006 at the Wayback Machine Retrieval Date: 10 August 2007. ^ Alsager Partnership website. Archived 30 November 2010 at the Wayback Machine Retrieval Date: 3 June 2010. ^ Alsager.com website. Retrieval Date: 10 May 2013. ^ Alsager Festival website. Archived 24 August 2010 at the Wayback Machine Retrieval Date: 3 June 2010. ^ Alsager Music Festival website. Retrieval Date: 10 May 2013. ^ "Potteries route 3 timetable". First Bus Group. Retrieved 17 November 2018. ^ "D&G route 317 and 318 timetables" (PDF). Cheshire East Borough Council. Retrieved 17 November 2018. ^ The Sentinel. Archived 24 September 2015 at the Wayback Machine Retrieval Date: 4 April 2014. ^ Alsager Residents Action Group website. Archived 7 July 2013 at Archive.today Retrieval Date: 10 May 2013. Wikimedia Commons has media related to Alsager.